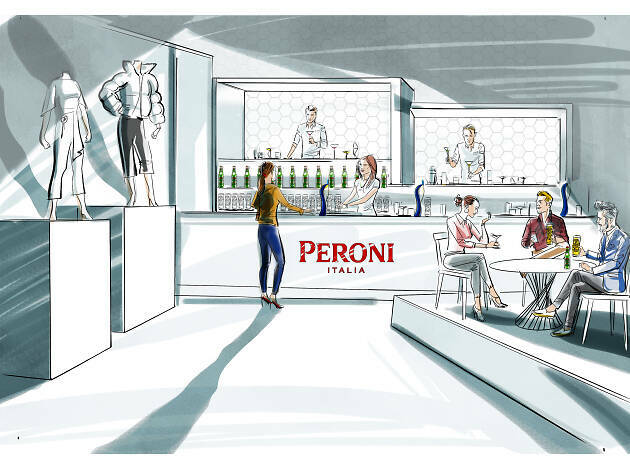 Kick back with the slick Italian beer brand at its latest edition on House of Peroni. 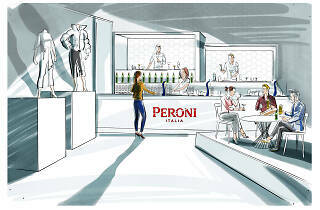 Eight distinct spaces inspired by emerging fashion designers will feature with botanical scents, flower walls and soundscapes making it a fun place to knock back some Peroni infused cocktails. Tickets are free but you’ll need to register in advance. Minutes away from Haggerston Overground station, Proud East is a canalside Bar/Restaurant tucked away from the streets. Once you turn the corner, you leave the busy streets behind and you’re hit by a sense of calm and quietness often reserved for residential streets. Looking from the outside, it just looks like another block of flats and you wonder if you’re at the right place. But step inside and suddenly into a really cool house party. Proud East has four main areas. There’s the intimate side where corners furnished with white sofa’s are dimly lit by mesmerizing blue and red lights giving off an luxurious feel. On the other side is the bustling kitchen that continues to produce mouth-watering modern British food and an open space perfect for mingling. This is where the party is really at. The party spills onto a casually chilled outside terrace which is spacious and comfy complete with cushions and finally, upstairs is where the cool kids hang out. Self-styled as a Sports Bar” (but there’s nothing sporty about it) there is a flat screen, bookshelves filled with books and a pool table and even more tables at comfy seats that overlooks the canal and mezzanine below. It really is just a really cool flat hosting a really cool house party. There’s food aplenty, there’s entertainment, a place to relax. Everything you could ask for. And unlike most parties, everyone’s invited. Great venue on the canal and really helpful staff. I would advise booking as it gets very busy. We shared some of the cicchetti dishes, all delicious. Next time ill try their pizzas as they looked so good coming out. The gelato was amazing. This is the best #HouseOfPeroni pop up by far. The setting is very relaxed, the design by Master of Style, Margherita Maccapani of Missoni is super stylish combining curves, geometry, mirroring and all-White is super smart. The cocktail menu, aperitivo and Negroni masterclasses by Master of Mixology, Simone Caporale is seriously good (I highly recommend the Negroni masterclass)! The food menu designed by Master of Taste, Francesco Mazzei of L'Anima & Sartorial is sooooooo yummy! Be warned, the cicchetti menu is extremely generous so best for sharing. The pizza was also top notch! Not to missed! I'm definitely going back for more! Oh just tried the Private Dining upstairs - AMAZING value as it's a proper Italian banquet. Go hungry as there is SO MUCH FOOD and unlimited Peroni! Popped into Proud East which is currently the House of Peroni as part of a sunny canal walk. Good tunes, friendly, smart staff and a very bright, spacious venue all with Peroni-themed décor. It genuinely felt like being on holiday in Italy. Drinks were all Peroni or cocktails with Peroni so if you don't like beer, this place isn't for you. Food was mainly pizza. Genuinely one of the nicest stone-baked pizzas I have ever eaten. Spicy and very tasty! House of Peroni at Proud East (Proud Archivist to those who know it) is a fun place to be this "summer". (If you find summer please call me at 07471234567). I went on a Friday evening after work aiming to go at the Proud Archivist so it was a pleasant surprise. Nice vibes, a bit messy and confusing service (too many staff but friendly and pleasant). I like the way the transformed the space, it is so well constructed it feels permanent. The design is nice and interesting with all these plants and vegetables all over the ceiling. You can also sit at the outdoor spaces (yard, balcony) and there are blankets you can use if you're cold! There is also a floating platform in the canal right outside the venue for the good days if any but it doesn't fit at all with the canal surroundings, more like italian sea side, which makes it a bit too much. Obviously serves cold nice Peroni beer in a variety of ways including cocktails. Cicchetti and pizza were very tasty and reasonably priced - there were offers such as 3 cicchetti for £1 and plenty of happy hours. We didn't get desert but we observed some interesting ones around! You cannot make reservations but if you're lucky you will find a table quite fast. I am so angry with myself that I didn't take any photos. There is a variety of events going on such as master-classes so visit their website for more details! Do pay a visit if you are around and fancy some cold beer and a little trip to Italy. It will be there till the end of the month! Wow what can I say, disaster from start to finish, ordered vegetarian arancini but got served the ham equivalent, waiter said maybe it's onion?! Ordered fish small plate later told unavailable. Ordered a puff pizza roll and dough inside was uncooked, waiter said maybe it's cheese!! Didn't even take it to the chef to show their mistake just said oh we just opened sorry!! I just asked for the bill right away....nice of them to charge the full price. They need to train their waiters before sending them out. Beware of food and service. Never going to one of their pop-ups again! Lucky enough to pop to the 1st night of the re-imagined House of Peroni residency last night. Have to say, it was great! The attention to detail was immaculate. From being greeted by Italian 'nonnas', to wandering through an Italian styled courtyard yard with laundry blowing in the wind, you can tell that the talented folks at Gingerline have had a hand in this iteration of Peroni's bi-annual pop-up. Sadly we didn't have time to go into any of the experience rooms but those who had said they were amazing. So, there's the excuse to go back! What a great atmosphere. Something completely different and really enjoyable. Drinks were comparable prices to local pubs (£5/pint, £8 cocktail), food was fantastic and it had a very authentic atmosphere. Would highly recommend. Have been in both May and October and both times have been great. Really enjoyed it and it changes each time it opens. Cocktails are also delicious. Felt like it was run by amateurs-no atmosphere whatsoever, hardly anything to see (we were asked to leave the art room as soon as we stepped in), and a good share of fake people. Tasty cocktail was only saving grace. Not a very welcoming place so we only stayed for one drink. Not sure what Peroni was trying to achieve with this?